One of the things that most distinguishes the Chileans from their Argentine neighbors and rivals is the centrality of bread in the Chilean diet versus the centrality of beef in the Argentine. Chileans, simply put, are carb loaders extraordinaire, shoveling massive amounts of bread into their shopping bags and mouths every day of the week. Average supermarket scene: mountains of Chilean bread, endlessly restocked throughout the day. From close observation, the Chilean diet is mostly bread, empanadas, various corn-based dishes such as pastel de chocolo and humitas, more bread, sandwiches of spectacular inventiveness and messiness, and the odd hunk of pork, all washed down with a fizzy soda. There are variations to this basic theme, and a few noble Chilean dishes worthy of poetry, but that’s mostly it. They also have some of the best seafood in the world, although Chileans eat surprisingly little of it, just as they drink surprisingly little of their own wine. Carbohydrates, however, are the main theme in the diet, and a meal without bread is like a car without gas. It’s going no where, and no one is happy about it. 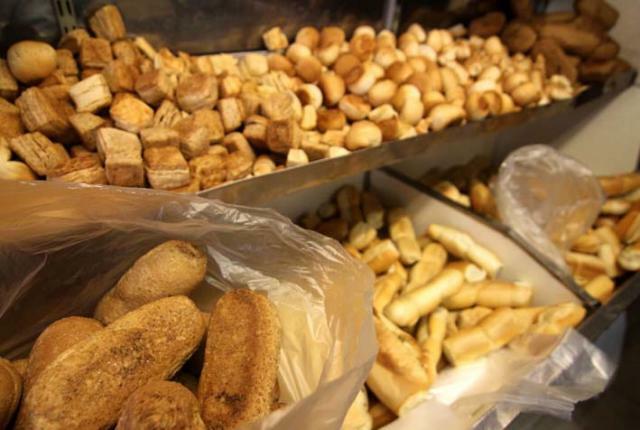 Bread is sold in most Chilean grocery stores by the kilo or by the piece from giant bins that are rapidly emptied by customers and just as rapidly refilled every fifteen minutes, all day long. At the end of the evening, when the ovens are turned off, you can almost guarantee that all the loaves will have been sold when the store closes. Chileans eat more bread (450 pounds per family per year) than anyone in the world except Germans. And unlike the Germans who have rye and pumpernickel and whole wheat, 97% of Chilean bread is white bread. Thus, bread is the staff, woolly socks, and hiking boots of life for the Chileans. In the countryside of Chile, along the public roads and in the parks, national and local, little old ladies sell fresh homemade pan amasado from baskets. Even alongside the main freeway, the Pan-American Highway, they’ll drag out a lawn chair, a portable bread oven on wheels, and put up a hand-lettered sign: “Pan Amasado”. Watch then, as Chilean drivers, who are the safest and most responsible in Latin America, swerve over three lanes of on-coming traffic to get at that hot loaf of doughy goodness. 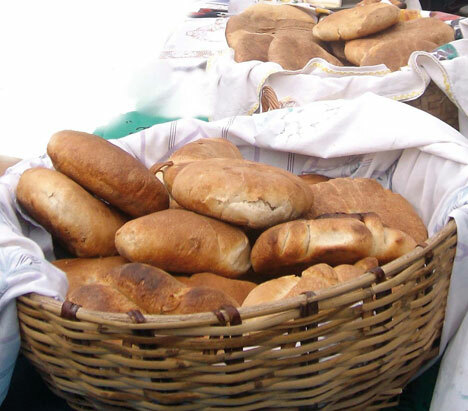 The correct translation of pan amasado is “kneaded bread”, and the words usually refer to a small, round, flatish loaf of white bread, called a hallulla, a sort of universal bun that’s often cooked in rural precincts in a wood-fired clay oven, un horno de leña. They’re made with lard (or vegetable shortening) and appear at most meals. Another reason pan amasado is a favorite is because it’s cheap. A hallulla sells for less than 15 cents, so you can really stuff it into your face without feeling guilty about wasting money. Pan Amasado Chileno, in it’s natural habitat, a basket. Not shown: stout mamacita with the carb face. I have a love-hate relationship with all bread, and pan amasado in particular. I love it when it’s good, like Chilean bread often is, but I hate what it does to me. I have a mild wheat allergy that will sometimes cause me to swell up and stop breathing, especially if I eat something overly doughy or nice and chewy, like thick pizza crust, or a second piece of pan amasado. And this is why I love the Argentine diet, because the ultimate cure for my carb face, and my illicit desire for kill-me-with-tastiness wheat, is beef, and lots of it. When I lived in Argentina, I pretty much had one meal a day: a bife de chorizo, with a few french fries, a light salad and a half-bottle of red wine. While eating this diet I never felt the slightest desire for bread. February 23, 2009. 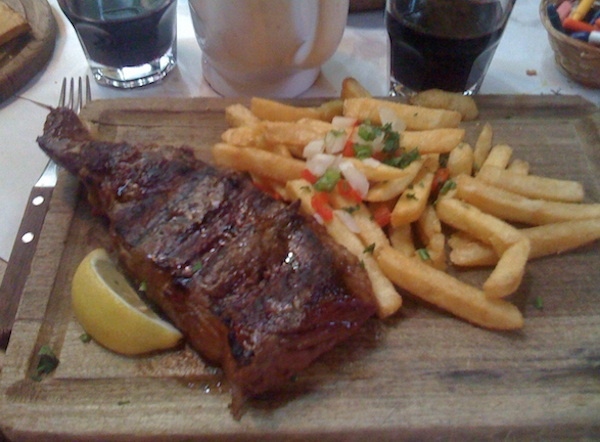 Bife de chorizo from La Cholita in Buenos Aires, Argentina. Make mine a double, por favor. The Fairway Market by my house sells these aged, sometimes at $20/pound. FDA hasn’t licensed it as such, but it is life extension therapy.